Dr. Neena Mukkamala is an accredited member of the American Dental Association, Academy of General Dentistry, Delaware State Dental Society, and Kent Sussex Dental Society, since 2003. She is a trusted dentist of her Medical & Dental Colleagues and their families. She specializes in restorative and cosmetics that enhance long term function and esthetics. Also, Dr. Neena is very active with creating restorative excellence on her patients. And her dedication to the dental health of children is very remarkable. She treats every child as if they were her own and continues to help the children in her community with care and compassion. Dr. Neena received her Doctorate of Dental Surgery Degree with excellence at the University of Southern California Dental School in Los Angeles, California. Upon Completion of her dental degree she continued her education as a resident in Advanced General Practice Residency for one year at Christiana Hospital in Wilmington, DE. She maintains her office concentrating on her patient’s mouth and teeth as an important part of the body and oral health being a major part of her patient’s general health. 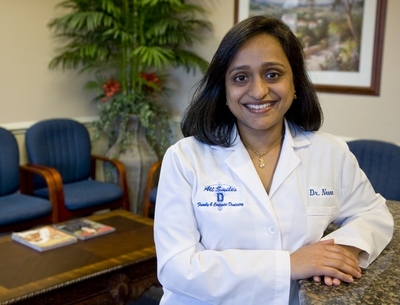 Dr. Neena thinks her patients are the most important part of her practice besides having her great team of friendly employees on whom her patients can always depend on when needed. Digital Radiography which uses 75 to 90 % less radiation than conventional radiography and it has much better diagnostic value to us than conventional film radiography. Digital Photography using intraoral cameras and digital oral cameras. High speed and deep curing lights to set the material we use more efficiently. State of the Art paperless office with website appointment scheduling available. When Dr. Neena is not practicing her passion of cosmetic dentistry, she spends most of her time with her lovely children, husband and parents. She loves being a mom and being there for her children when they need her in addition to being the best dentist for her patients.